Ames’ Roman is a typeface created by Paul James Lloyd and published by Greater Albion Typefounders that comes in 4 widhts (Condensed, Wide, Regular, Expanded) & 4 weights (Light, Bold, Regular, Black). It is recommanded for heading, text, display. 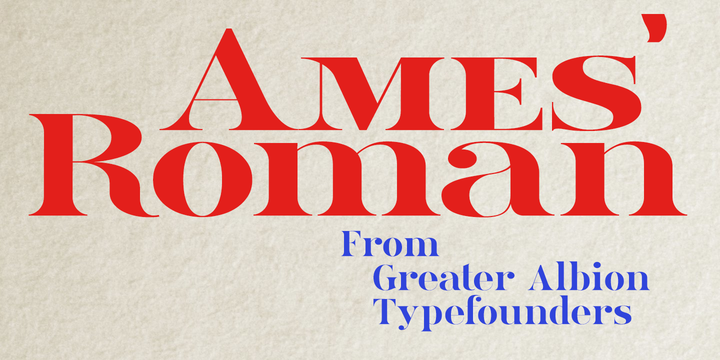 “Ames’ Roman” is a trademark of Greater Albion Typefounders. A font description published on Thursday, February 13th, 2014 in Fonts, Greater Albion Typefounders by Alexandra that has 4,791 views.